I seem to be writing a lot about central agency changes recently as I now learn that Michael Mahan at Worth Avenue Yachts has taken over the listing for the 34.1m motor yacht Sentimental Journey. Built by Lloyds Ships in 1983 with internal decor upgrades, Sentimental Journey accommodates 12 guests in six staterooms plus six crew. A true bluewater cruising yacht, she has a range of 3,000 nautical miles at 9 knots. 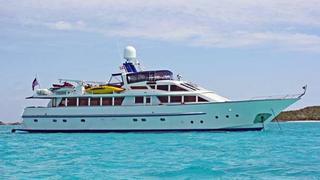 Currently en-route to Newport, Rhode Island, Sentimental Journey is asking $1.495 million.